Zoë, what was your background and life before yoga? I began practicing yoga around my 16th birthday so there wasn’t all that much life before yoga! I grew up in Brooklyn. I was an only child, so I spent a lot of time alone, which I’ve always enjoyed. I loved to read and could generally be found curled up in a corner with a book. I was never very interested in doing anything physical until I found yoga and part of what drew me to it was the focus and solitariness of it. But rather than making me retreat from the world, it helped me feel both more connected to myself and able to engage with others. A friend of my mom’s gave her a videotape of Rodney Yee and the first time I practiced along with it I was hooked. A couple of years later I started taking vinyasa classes, first at a nearby gym and then at the few yoga studios that existed back then. I also took a teacher training, just for fun. I was eighteen and studying engineering at the time so I never really planned on teaching, but immediately people started offering me classes. I took some Ashtanga based classes here and there and sometimes practiced to Richard Freeman’s primary series tape at home. 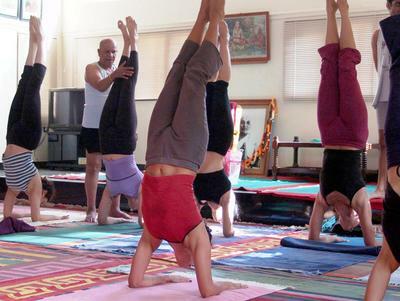 Then, one memorable Saturday morning, a friend took me to a Mysore class. I just went in and did primary series as if I practiced it all the time and from then on I did! Walk us through that initial Mysore experience, what was it like? What were Guruji and Sharath like? My first trip to Mysore was amazing. I was only 20 when I got there and soon after had my 21st birthday. 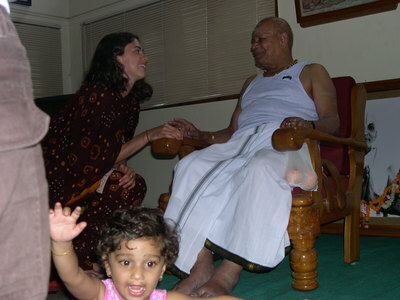 I remember arriving after the very long journey – the long flights and harrowing car ride from Bangalore on the old road - wondering what I was doing there, but soon after feeling very much at home. It was very different then, only 12 people in the room and so we got lots of attention from both Guruji and Sharath. I had planned to be there for 3 months but ended up staying for 5. It was intense and wonderful and opened me up in ways I never could have dreamed. My first month, every day after holding my thighs in back-bending I would start crying. Guruji would say, “Why you cry?” but I didn’t know, it was just old emotion coming out of me. And then it passed. Guruji was always very gentle with me, he could feel my sensitivities and his touch was really soft and magical, it always felt like he was working much more on an energetic plane than a physical one. Sharath was gentle and warm and encouraging, his touch like butter. My favorite thing was conference. Every day Guruji used to sit in his little front room and read the paper and sometimes the mail and we were always welcome to come sit. I remember watching the sunlight wane through the window as Guruji answered people’s questions and quoted Sanskrit verses. I was too young and shy to ask much but I soaked it all in. Zoë, let’s go deeper into what you mentioned about the energetic plane. How can a student balance the physical asana as a tool to go deeply inward and not get too enveloped in the physical expression of the practice? Where is the balance between both? I’ve been working on a translation of the Aparokṣānubhūti, an 8th century text written by Shankaracharya which revolves around the idea of not getting caught in the illusion of mistaking the body for the Soul. The verses repeatedly assert that the body is intended as only a vehicle to self-knowledge. And that was always the feeling I got from Guruji. Perhaps the balance can come from reading these texts and developing a broader understanding of the practice and the greater intention it is meant to embody. Speaking of Shankaracharya and the body used as an aid to the Self, do you find a separate sitting practice beneficial in the quest to the Absolute? Honestly, I wish I had more of a sitting practice, but it’s very hard to find the time. I wake up at 3:30am and do an hour or so of Sanskrit study/translating/writing and then practice and teach all morning and I also teach an afternoon Mysore class. I would like to move towards a better balance of those things. 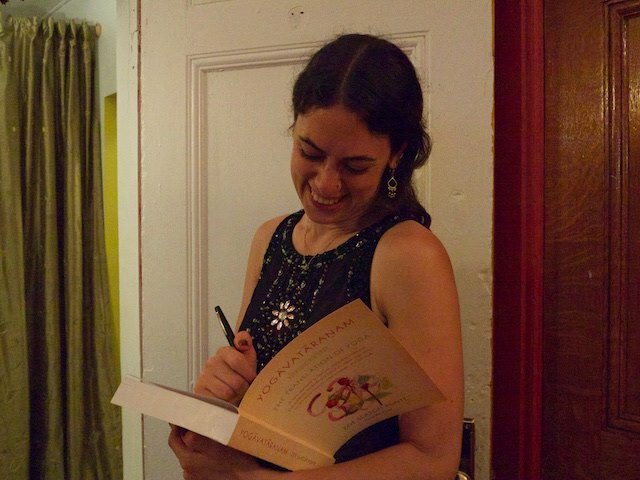 I really love to teach and having my own shala, I find that teaching often takes precedent. When I do have free time during the day I try to do a bit more writing and also just like to have some down time, cook, read, walk in the park, etc. But I am working towards finding more time for sitting and pranayama practice. I do find reading/studying Sanskrit to be quite meditative though. The first time I heard Guruji chant the opening mantra at the Puck Building something deep within me was sparked. But even before then I’d always loved chanting, from the first yoga class I’d ever been to. I studied Hebrew as a kid and something felt immediately resonant and familiar the first time I heard Sanskrit. I felt a profound connection to something magical and inexplicable. I really started to study Sanskrit during my first trip to India. I was staying at Post Office House (so named because it was next door to the office) and my roommate had a teacher who would come to the house a couple of days a week. His name was Vināyaka, which means “remover of obstacles” and is an epithet for the elephant-headed god, Gaṇeśa. And remove the obstacles he did! I remember he would bring his harmonium – the Sanskrit sounds have always been linked to music in my mind. I loved learning the alphabet, the feeling of the strange sounds rolling off my tongue and the recognition of familiar words as I started to be able to string the letters together. After my first trip to Mysore, I came home and bought a Sanskrit textbook and very diligently continued on my own, an hour a day, for about six months. But I eventually gave up because it was too hard to continue without a teacher. Soon after, I went back to Mysore and started studying again. Re-inspired, I again came home, bought a new book and tried on my own. This happened quite a few times before I went back to school at Columbia University and started studying more rigorously with a teacher. But I have still always maintained that connection to the oral tradition and read texts and teach from that place. There was an obvious instant connection with Sanskrit that went beyond casual reading. You recently published a book. How did that evolve? I had been in a PhD program at Columbia, but decided to leave after the M.A. Two days after I defended my thesis – a translation of a text on yoga and Ayurveda – I opened my yoga shala. I started teaching some Sanskrit classes at the shala and since I didn’t really like any of the existing textbooks, I wrote some handouts for each class. It was a small but enthusiastic group and we moved along pretty quickly. After a few months, I realized that I had about 60 pages worth of notes. I was talking about it to a friend and he suggested that I show it to a publisher. I did and wrote a proposal and soon after I had a book deal! I went back to school with the intention of wanting to deepen my knowledge and I left academia with the desire to speak to a wider audience. I was left with the desire to build a bridge between those two worlds and writing Yogāvatāraṇam was my way of doing that. It is my attempt to make studying Sanskrit and reading yoga-related texts more accessible and enjoyable to a wider audience of yoga practitioners. I wanted to share my love for the language and philosophy and hopefully inspire others to want to read the original texts themselves. Zoë, as a long-time practitioner, what changes do you see both physically and mentally as you age? How can students adapt our physical changes? Does the shift become more inward? Since I started practicing so young, the physical postures came pretty quickly and easily at the beginning, even though I wasn’t naturally very flexible or strong. One of the things I’ve had to make peace with as I get older is that the practice has gotten harder and I can no longer do things as effortlessly as I could before. But my practice is much richer on so many levels. It brings me a lot more calmness and contentment, steadiness and joy, than it did before. 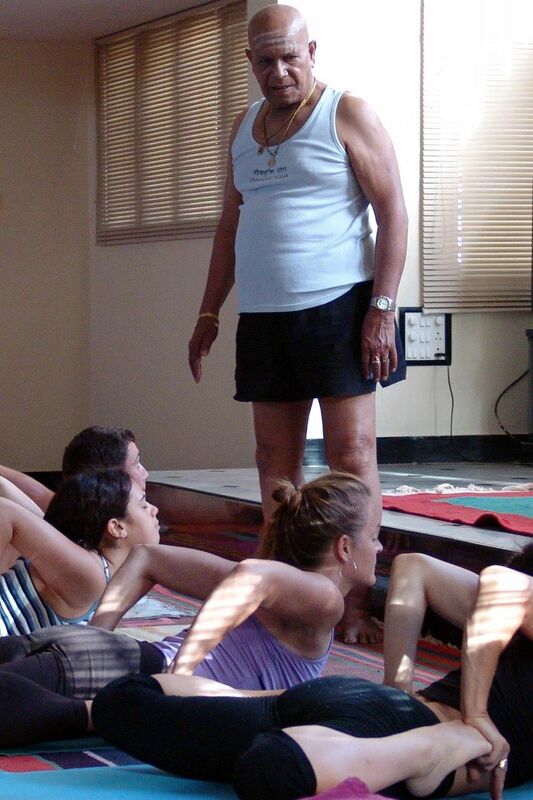 I think as you age, you have to pay a lot more attention and that takes you much deeper into the practice. I have a lot of students in their fifties and sixties and am constantly inspired by their patience and grace. I definitely think there is a natural shift inwards as you get older and it helps to inspire concentration and an interest in the more contemplative aspects of practice. The practice asks you to become more mindful and to move more slowly and to pay closer attention to the quality of your breath and the movements of your mind. ​Students keep asking me how we can view the current political situation through the lens of yoga philosophy. On a very basic level, the yoga tradition tends to view everything as cyclical, on both a small and large scale, and understands that from the darkness emerges light, just as the lotus emerges from the mud. Maybe we have to face that darkness in order to create real change. But given that the practice was originally intended as a means for renouncing the world and becoming liberated from the cycle of saṃsāra, worldly existence, I don’t know that there is a direct way to apply the philosophy. And perhaps that realization is important. We are living in a new time and in new circumstances and perhaps the most important thing we must do is pay attention to the present moment. The practice can help give us the tools to see more clearly, support us to be compassionate, truthful and resolute and to fight for the peace and freedom that we cherish, for all people and for our planet. I think perhaps the greatest lesson I learned from Guruji was to look for the divine essence in all beings. It feels particularly relevant in this moment in time that we focus on that which draws us together, rather than that which divides us. And all beings in the Soul. Sees everywhere the same essence. Editorial note: Click here for additional information on Zoë's Sansrkit book.